This is one of those rare cross over applications between iOS and your Apple. You are all iOS enabled – apps installed and ready – but you either need to buy one of those special ‘air printers’ to turn your iOS world into hard copy – or ‘fu-gged about it’. AirPrint Activator is a small application that will enable a Mac OSX 10.6.5 + iTunes 10.1 hidden feature to allow your shared printer to be visible on your iOS 4.2.1 devices. AirPrint allow you to print from new generation of Apple iPhones, iPad and iPod Touch to a printer shared over your personal WiFi network. You only need to run AirPrint Activator once. Once AirPrint has been turned on it will remain on even after a reboot. AirPrint Activator from Netputing is the application, check it out. We are currently looking for a provider to offer this service to our members. Please stay tuned. Copyright © 1994 - 2012 Maui Apple Users Society. 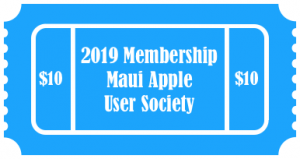 The Maui Apple Users Society is a recognized Apple User Group by Apple Inc.
Our Acceptable Use policy can be found here.